In November, December and January, I, along with the majority of other council members, voted “Yes” on four occasions for an ordinance that allows voters to re-consider the pros and cons of runoffs and decide again whether or not we should legislate reinstating runoffs for our municipal elections (not Board of Ed). Mayor Bhalla vetoed this ordinance and the City Council will be voting for a fifth time tomorrow night. Mayor Bhalla wishes to continue our current municipal elections as it exists and says allowing a vote this November to revert back to the runoff system is not a good government option. The majority of the City Council and I disagreed and believed the voters should make the determination on runoff elections. - Popular sovereignty - Voters should decide, not the government. - Majority rule - Our elected representatives should be voted in by a majority. - Political freedom - People have the ability to change their minds. Additionally, I am completely supportive of pursuing State approval to allow “instant runoffs” aka “ranked voting” as an election choice as well. It is currently not provided for under NJ State law and would require legislative action. It has recently been introduced into the legislature by a Bergen County Assemblyman. We will also be voting on a resolution in support of this that has been revised since the last council meeting. What has been influencing my thoughts on this? During the previous election, most people I spoke with – both in and outside of the 2nd Ward - expressed concern that we risked having the leadership of our city being elected with not only less than a majority, but possibly a fraction of all voters. No one wanted this and the topic of reinstating runoffs was raised repeatedly. This was the first time voters were faced with this possibility in five years since voters eliminated the runoffs with a majority vote in 2012. And when the results came in, and the fear was realized, the aftermath has been the feeling of a fractured community where many don’t feel fully invested in the new leadership, and the new leadership doesn’t have the confidence of having support from the majority. This will heal over time, but our starting point has been difficult. The ordinance we are voting on is not to actually determine to re-instate runoff, but rather whether voters should again have the chance to debate this and then vote on it taking into consideration their most recent experiences. 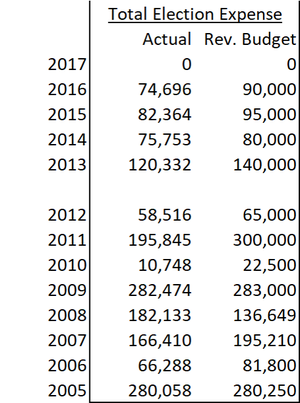 - The last times we had only Senate / Congressional seats as Upper Ballot elections was 2006 and 2014 when we had over 11k and 9k voters, respectively. Sources for all information from Hudson County and Hoboken City Clerk. - Their elections are different than Hoboken’s in that all nine seats (3 At Large / 6 Ward) run with the Mayor. - In the general election, 39k people came out to vote, with 77% voting for Fulop. So his existence in the race drove turnout and he not being in the runoffs would naturally result in lower turnout on a comparison basis. 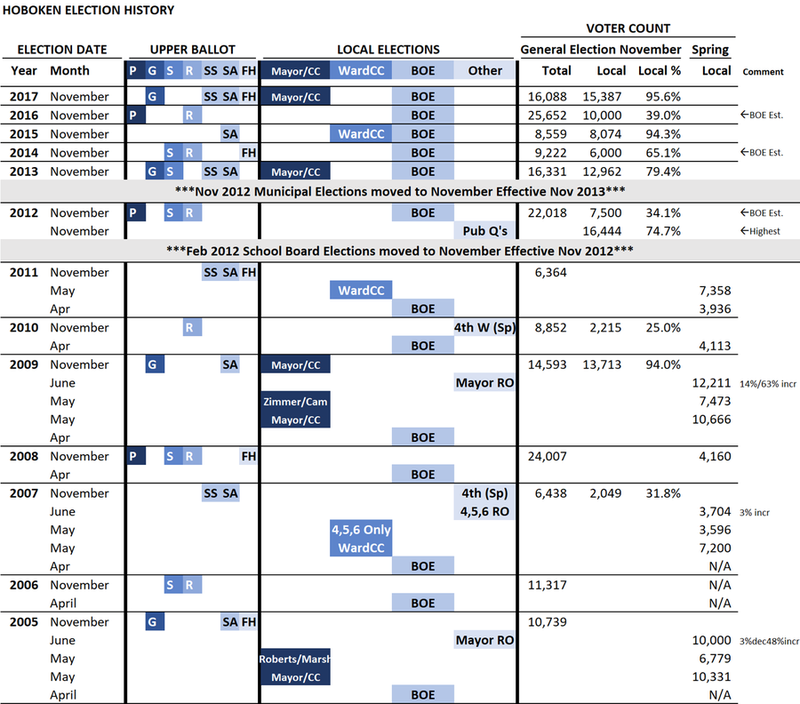 - Ward E in particular had its own specific circumstances that led to the plurality lead – Symes – losing in the runoff. The cost of elections: A number of $140k per year has been circulated as the incremental costs of a runoff with no back up for this number. This seems high and seems to reflect the number that was used in 2012 for the savings relating to BOTH moving the elections and eliminating the runoffs. I was given an estimate from the City Clerk’s office of much lower (so low that I question it). Below is the historical costs of our elections as disclosed in our annual budgets. This begs some additional scrubbing to understand better. Regardless, the question voters can consider is whether an incremental cost of .1%-.2% that could occur every two years is a waste of money or a good investment. Hoboken’s organized “paid for votes”. I am excited to see Mayor Bhalla come out publicly and use his platform to bring attention to this important issue. Mayor Bhalla has an important alliance we hope he will leverage which is his strong personal and political relationship with our new Attorney General Gurbir Grewal. We should ask that he call on his friend to take a close look at our elections and what we can do to reduce the threat of paid-for-votes. This could be very powerful and a game changer for Hoboken. I am very passionate about doing what we can to eradicate paid-for-votes and have been very vocal publicly and proactively about this for the past two years. It was my reason for getting involved with the Democratic committee. And this past year, as Chair, I, along with the chair of the Republic Committee, was able to make some changes to poll workers that hopefully had a positive impact and can do even more in the upcoming year. Also, as an elected official I am also committed to doing more to engage with these voters whose actions may be financially driven, but also may be due to being disenfranchised and feeling not represented in our own community. Election Impact of Paid-for-votes. They impact all elections. The question is where is the potential impact the greatest which is when the ratio of paid-for-votes to total votes is greatest – so when overall turnout is low, but also when there are a lot of candidates that divide the voter base even in a high turnout election resulting in lower votes per candidate. Like our recent city-wide election with 15K voters that were divvied up between six candidates. Mayor Bhalla has indicated the number of paid-for-votes to be 500-1000 and I would agree with that. I also believe this number has declined unfortunately due to the continued displacement of lower income residents who are most susceptible to selling their vote. But if you use these numbers, so long as total turnout is greater than 5,000 the impact on a city-wide runoff race would be less having only two candidates vying for the majority. The question to ask is which scenario is better which we can continue to understand and debate. As with anything that is so important for our community, please know that I will always do as much research as possible to determine the right direction. And I will always come to you for your thoughts. With so much information circulating that is biased in its nature, I wanted to provide you with some additional information that you may not already have. This letter has some bias in it – my actions of voting in favor of this four times has the same bias. But I welcome any additional thoughts and color you may have as well before tomorrow night’s vote. At the end of the day it is your voice that matters the most. Thank you and please do not hesitate to call me at 201/208-1674 or email me if you want to discuss. PS - For the record, and only because it has been raised by others including Mayor Bhalla, I did not vote to eliminate the runoffs in 2012. Hoboken Master Plan to finally see update?